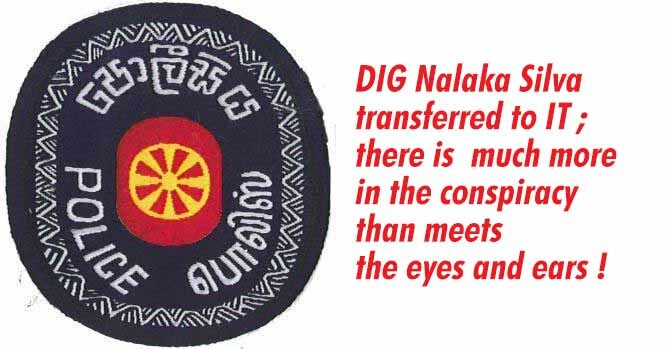 LEN - www.lankaenews.com | DIG Nalaka Silva transferred to IT ; there is much more in the conspiracy than meets the eyes and ears ! (Lanka e News -17.Sep.2018, 11.45PM) Following the exposures based on a number of tape recordings collected from a two penny half penny worth double agent police informant by the opposition heroin peddlers for a fee , DIG Nalaka Silva in charge of the TID had been transferred out from that department until the investigations are over. On the instructions of the IGP , Nalaka has been transferred to Police information technology division (IT) . Based on the ongoing investigations some of the tape recordings the informant had released are spurious.It is only one who is suffering from a mental imbalance will believe that a DIG will discuss with a two penny half penny police informant to assassinate a president of a country. In any case it has come to light there is much more than meets the eyes and ears in relation to this conspiracy . It is learnt the final aim of this conspiracy is to create misgivings among the Police , IGP and the people , while also at the same time sow seeds of suspicion against the FCID and its credibility with a view to create suspicions and doubts in the minds as regards the charges mounted against the ace notorious rogues. Following the establishment of the courts with a panel of three judges to hear cases continuously , the heroin peddlers and rogues are panic stricken. They are staging walks to topple the government, excreting in their pants and going back while blaming on the milk packets. They are taking flights to India. They are concocting fairy tales that there are attempts to murder president and Gota. They are creating an atmosphere of suspicion and misgivings among the police , IGP and the people. Next they are to malign the judges who are continuously hearing cases in order to accelerate the punishment to rogues and heroin peddlers. The whole aim and agenda of all these machinations and treacheries is to somehow escape from their criminal entanglements from which they have no escape otherwise.